After a long day in the fields and the woods taking your ATV for spin, it’s great to have a cooler on hand to provide drinks and snacks to refresh you. Sport vehicle manufacturer Polaris Vehicle has taken that in mind with the creation of its own brand of coolers, which is meant for owners of ATVs, UTVs, neighborhood electric vehicles, snowmobiles and similar vehicles that provide fun and adventure that motorcycles, dirt bikes and other vehicles cannot. Even if you don’t own one of these vehicles, Polaris cooler will be able function properly for any occasion that you have planned for the weekend. Due to the environments that sports vehicle owners usually find themselves in, Polaris has designed its NorthStar ice chests to be as tough as possible to ensure that rain, snow, wind and animals don’t leave any scratches or dents after rides in the woods. Ice retention is a heavy focus for this Minnesota-based company so that ice stays cold for as long as customers are out on their vehicles. Accessories are included to add to the user experience, whether its security of items inside from nature or convenience for finding and placing food and drinks. Our Polaris cooler review aims to let you know just how it earned a 4.8/5 rating in overall performance and how much this brand will improve your next ATV ride. To ensure that potential customers are as informed about this brand as possible, we’ve included a lineup table that provides details about the features of the Polaris ice chest. Take a look at the table below to get a better idea of how Polaris stacks up in the cooler world. Durability is a major focus for Polaris with its Northstar cooler lineup considering that sports vehicle owners are often in the wilderness, so the company gave its ice chests a tough molded construction so that it can handle falling off your ATV or UTV without being dented, as well as falling off a rock or down a hill when you take a break. In case you’re worried about animals, both large and small, trying to get into your cooler while you’re sleeping or fishing in another area, this brand is IGBC Certified Bear-Resistant, which will leave your items safe and the outside scratch-free. Those looking to support more American-made products will be happy to know that Northstar coolers are made in the United States. Several features are included to make usage as easy and convenient as possible, including the ComfortCarry handles, which have a comfortable design so that you don’t have a tough time carrying a fully-loaded ice chest from your ATV to a campsite. The non-slip rubber feet help your cooler stay wherever you put it, whether it’s on your vehicle or on a log when you and your friends take a break, no matter how much it rains or snows. Whether you’re taking the cooler out for a spin on your off-road vehicle or a day out on the water on a boat, your ice chest will stay secure thanks to the TravelLock system. The hinge and latches are made of UV resistant polyethylene and aluminum to keep the sun from damaging the outside. These straightforward additions earn Polaris a 4.8/5 in features. 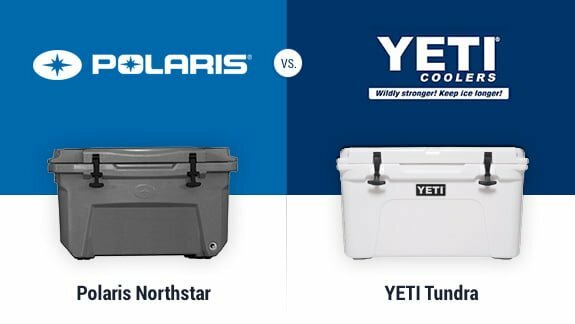 All cooler owners worry about their drinks and food staying cold for the entirety of their adventures, and that won’t be a problem with the Northstar series, as Polaris claims that these coolers have an ice retention that outlasts that of Yeti, the top dog in the ice chest game, by 30 hours, earning a 5/5 in this category. 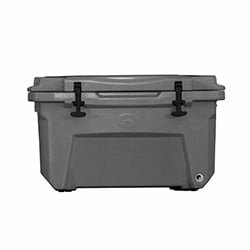 These coolers’ ability to keep items cold has granted the company plenty of praise in online reviews, although we’re still about to verify this in our planned ice retention test vs. the YETI. Those respectable ice retention times are achieved thanks to 2-in. thick PolarWall insulation, an IceLock seal for keeping cold air inside, an EasyOut drain system for getting rid of melted ice at the end of the day, and UV resistant design for keeping the sun from heating the ice chest up. TIP: To maximize ice retention you can pre-chill your cooler. You may also put some quality ice packs in, along with the regular ice. We covered the best cooler ice packs here. it starts with the 30 Quart cooler, which weighs 20.3 pounds and measures 25.5 in. x 17.8 in. x 19.5 in. next is the 60 QT ice chest, weighing in at 36.3 pounds and has a dimension of 18.3 in. x 20 in. x 32 in. 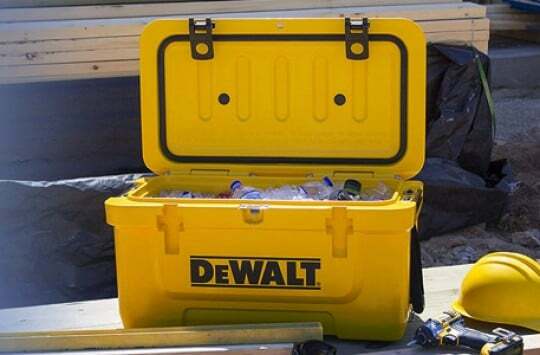 the biggest option is the 105 QT cooler, which outweighs its counterparts greatly and measures 40 in. x 23 in. x 18 in. Desert and graphite are the color options for this brand, which makes your choices simple and reflective of the environment that these coolers are suited for. When it comes to being protected against issues that come with manufacturing, Polaris provides a warranty to Northstar cooler owners of one year from the date of purchase. This coverage matches up with the simple and straightforward design and usage that this brand promises. This is comparable to the warranty of RTIC, which keeps you covered for up to one year. However, Polaris has a long way to go before catching up to Yeti, which has a warranty of five years, Esky, which keeps you covered for six years, and Otterbox, Siberian and Orca, all which come with lifetime warranties. As we mentioned before, Polaris Northstar coolers are best suited for PowerSports Vehicle owners (ATV, UTV, SxS and so on) so that they have snacks and drinks on hand when they finish riding through fields and hills. RELATED POST: Check out our list of the best ATV coolers right here. 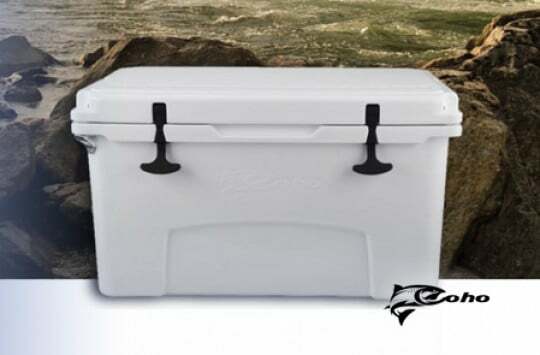 However, part of being a successful ice chest brand is being able to satisfy customers in other situations, such as fishing and camping trips, which is possible with these coolers because of their ability to handle the worst that nature has to offer. You could use these coolers for a party at your friend’s house (but honestly, these are better coolers for that) or tailgating for a football game, but the outdoors is where they work best. No successful cooler brand is complete without accessories, and Polaris has several available to improve the user experience. 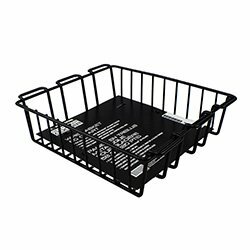 Holding your drinks and food is made simple thanks to the wire basket for the 60 QT cooler, which keeps items from falling out thanks to its powdered coated steel design and looks fresh almost always due to its gloss finish. This addition is located right under the lid so that you waste no time getting your items out of the cooler, and the black powder coating is food safe, ensuring that your lunches are not contaminated. In case you’re worried about your accessories getting lost or falling out of your cooler during a ride, Polaris provides a Lock and Ride quickstrap set to keep everything secure. This addition is designed to work with all of Polaris’ UTV models, and it works by attaching the anchor plunges and the adjustable rubber strap to the tie-down points on the cooler. The straps are made easy to tighten so that everything stays inside. 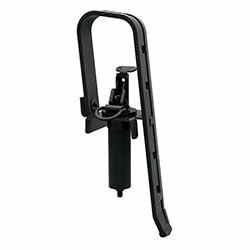 Extra security is provided for whatever you have in your coolers thanks to Polaris’ Lock and Ride ATV tie-down anchors, which come with a set of four anchors to match up with the tie down points on the company’s ATVs. 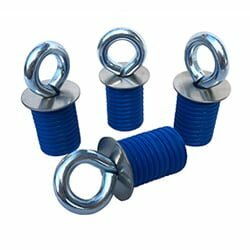 These anchors are designed to be easy to turn and tighten so that you don’t have to do so repeatedly, as well as so that you can easily add and move tie-down points. They also come with a new, longer plug to make sure that your food, gear or equipment are safe in your ice chest. As with most of our cooler reviews, we measure our coolers’ quality by comparing them to Yeti, the biggest name in the industry. 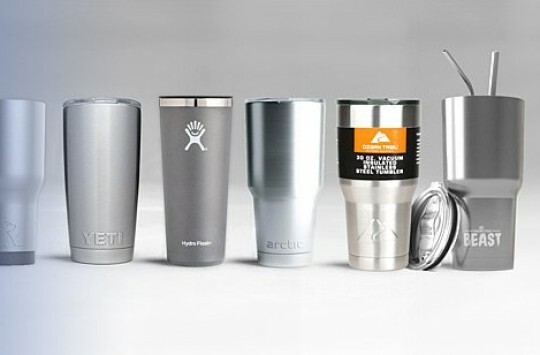 Yeti definitely has the advantage in name recognition, but these two brands share plenty of similarities in their design and function that are just as great as their differences. Outdoor use is among the similarities, with Polaris designing its ice chests for sports vehicle owners and Yeti designing its own for hunters and fishermen. Use in the wilderness also motivated these companies to provide a construction that ensures the biggest of animals, such as bears and mountain lions, as well as the worst of weather conditions, including rain and hail, don’t keep their products from doing their job. Size options is where we start to see differences. While Yeti has coolers in the same size range as Polaris’, it’s options don’t stop there and go way up due to their use for holding moose, elk and other big game. Yeti’s biggest option is the Tundra 350, which measures 24.75 in. x 23.25 in. x 63.5 in. 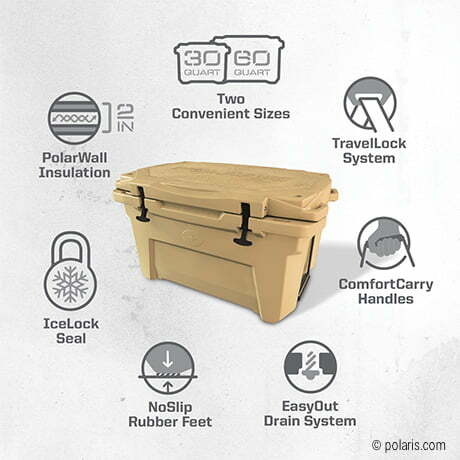 However, Polaris gets a win when it comes to price, as it offers its ice chests in the $200 to $400 range, which also gives the company a 4.5/5 in this area. 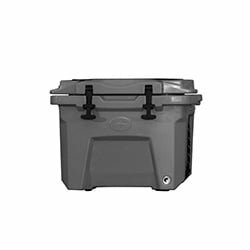 Yeti has coolers available in this range, but the use for bigger game results in an increase in price for bigger options, with the Tundra 350 currently being available for about $1,300 or so. Yeti has a reliable reputation and definitely performs well enough to try out, but Polaris can perform just as well despite the size differences and saves you a buck in the process. We advise giving the latter consideration, especially if you have a new ATV or UTV that you want to try out. Polaris Northstar Coolers for Sale – Where to Buy? Amazon is our recommendation when it comes to places to buy coolers, including those of the Polaris brand. This website has proven to be a trusting spot for buying items online, offering plenty of actual user reviews that act as second opinions and the option to return your purchase if it doesn’t perform as well as you hoped. Being an Amazon Prime member gives you access to additional benefits, including free shipping. 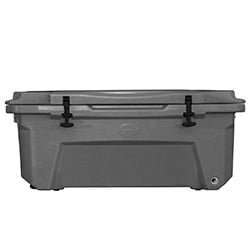 The Northstar 30 QT and 60 QT options are currently available on Amazon, and Polaris’ website is another good spot for buying these products, especially if you prefer the 105 QT ice chest. In case you own a sports vehicle and was wondering if there is a brand of coolers out there just for you, Polaris is here to satisfy your needs. This company’s Northstar ice chests are designed to handle the worst that nature can throw at it, and accessories are available to ensure the security of your items. Whatever you keep inside will stay cold for your whole trip, and the prices help you save money for other things you want to buy for your drives out in the woods. Give Polaris Northstar coolers a shot the next time you plan to take your ATV for a joy ride. Polaris NorthStar ice chests are designed to handle the worst that nature can throw at it, and accessories are available to ensure the security of your items. Whatever you keep inside will stay cold for your whole trip, and the prices help you save money for other things you want to buy for your drives out in the woods.